Joseph Kentenich was born November 18, 1885, to a single mom in a small village near Cologne, Germany. Raised and educated in an orphanage from the age of eight-and-a-half until 18, he had already decided by the age of 12 to become a Catholic priest. On October 18, 1914, just two months after the outbreak of WWI, with a small group of high school Pallottine Seminarians, Fr. Kentenich founded what was to become known as the International Schoenstatt Family Life Movement. “Schoenstatt”, in German, means “a beautiful place”. 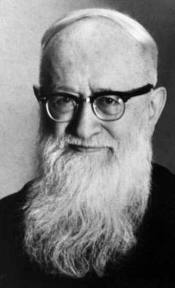 Through two world wars, three years in the Dachau Concentration Camp in Hitler’s Germany, and 14 years of exile from the Marian Family Movement he founded by church authorities, he continued steadfast and fruitful in his Covenant of Love with the Blessed Mother and in his service to church and world. His Theology was both deeply traditional and very modern, infused with a great love of the Holy Trinity and a painful awareness of the tragic absence in modern consciousness of the presence of God as a strong, loving, and merciful Father. On October 22, 1965, just as the Second Vatican Council was drawing to a close, Pope Paul VI restored him to his leadership of the rapidly growing International Schoenstatt Movement. He died September 15, 1968 in the Adoration Church on Mount Schoenstatt. He had chosen just two Latin words to go on his tomb to summarize his life: Dilexit ecclesiam, he loved the Church. The materials in this section will lead you to the remarkable details of his life story and its rich spiritual fruits in thousands of lives across the globe.